When I think about the future of the global wine market, my thoughts frequently stray to Australia because that’s where I see so many current trends originating or being most effectively exploited. Export driven marketing strategy? That’s Australia. Branded varietal wines? Everyone talks about Gallo and Constellation brands, but who has done it better than [Yellow Tail]? Foreign market penetration? The Aussies again, replacing the French as the strongest competitor in the British market and a strong presence in the United States. Australia even wins the prize for the most sophisticated national wine strategy. 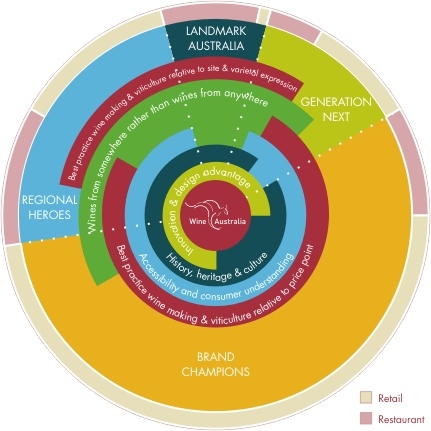 Click on the image above to see a representation of the latest Australia wine strategy, which divides the market into twenty (20!) key segments where Aussie wines can compete. No doubt about it, if you want to learn about wine economics and integrated wine business, you should look to Australia. But that doesn’t mean that all is well down under. As I have written in previous posts, Australia has experienced a roller-coaster of wine market problems. First it was the problem of over-supply, which pushed prices down to unsustainable levels. And then, just when it seemed like things couldn’t get worse, they did and the early signs of wine shortages began to appear, which caused me to declare that the era of cheap wine was coming to an end. In each of these cases, trends that I see in many places now were first apparent in Oz. No wonder that I’m starting to view Australia as my leading indicator of global wine market trends. This makes the news in Jancis Robinson’s column in Saturday’s Financial Times particularly sobering (not a good word for wine lovers). Robinson’s article suggests that Australia has hit ecological limits to the production of cheap wine. Water is scarce and expensive and this means that the cost (and therefore price) of bulk wines like [Yellow Tail] must rise — from A$0.40 in 2006 to A$1 in 2007 according to the article. That’s not quite a leap from unsustainable to unaffordable (the A$ is about 91 US cents today), but it presents a completely different business model. More to the point, however, the price rises exist because costs are high and the product is in short supply. Robinson is optimistic that Australian winemakers can compete and even thrive in the new market environment, but adjustment won’t be easy. There is much talk, though not much evidence, of basic bulk wine being imported into Australia from southern Europe, South Africa and South America to fill the so-called “casks” (boxed wine) and the cheapest bottles and flagons for the bottom end of the domestic market, prioritising export markets for such inexpensive Australian wine as the brand owners can afford. Australia has swung from famine to feast and back to famine in terms of its wine supply recently and bulk wine imports are nothing new. I remember encountering a director of one of Australia’s largest wine companies looking very shifty round the back of some fermentation vats at Concha y Toro outside Santiago de Chile in the mid-1990s. Now the problem here is not that the Australian’s are passing off foreign wines as their own. The wines I have seen have been clearly labeled and the few cases I know about where winemakers have tried to fool the public (some years ago in New Zealand, as I recall) ended badly for the dishonest producers. They were punished pretty severely in the marketplace when their tricks were revealed. No, my concern goes more to the heart of the problem. Maybe Australia’s ecological constraints are a short term problem that will disappear. Maybe it is an Australian problem with no implications beyond the land of Oz. Maybe ready supply from Australia wannabe producers in South America, South Africa and Europe will always be there to fill the gap. But that’s a lot of maybes and economists are trained to get nervous when it’s maybe this and maybe that. We know that the effect of climate change on the wine industry is real. And we know — or at least I think I know — that Australia has often been a good indicator of emerging trends in global wine. If this is the case, then we are indeed about to enter a new wine world, one where the natural constraints on wine production may be about to become as important as marketing strategies. « The World’s Best Wine Magazine? I just wanted to say that your website is incredibly interesting and enjoyable to read. However, I wanted to correct an error in your reporting on the (20) segments of the brand Australia strategy. I just want to specify that there are only four segments indicated in the strategy and that the other categories actually represent the relative importance of each theme across each of the strategies indicated. On all other fronts, I found your comments both refreshing and free of error. On a personal note, I’d be interested in your take on the bottle-closure debate.